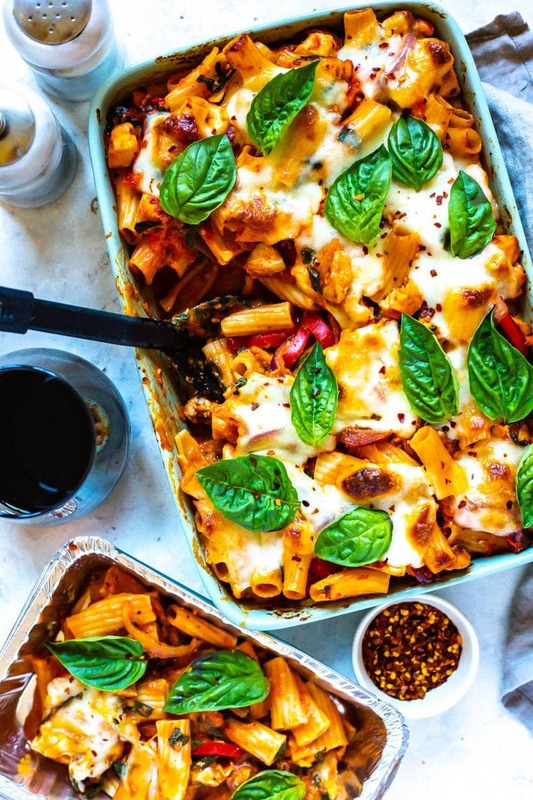 This Chicken Pasta Bake is a freezer-friendly comfort food recipe made with rigatoni, red peppers, onions and spinach in a light rose sauce topped with lots of mozzarella cheese! Oh winter. We have a love-hate relationship. I really do love all kinds of comfort food and it's sort of nice to come home after a long, cold snowy day to a hot meal – you just can't appreciate this sort of chicken pasta bake in the summer as you can in the winter. And oftentimes I find myself super de-motivated to cook in the winter, I'll come home and just want something already prepared. 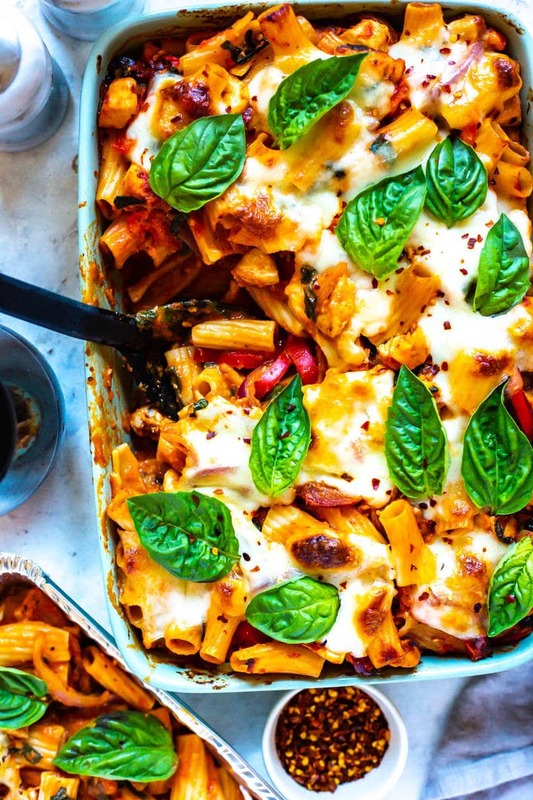 YES, this freezer-friendly chicken pasta bake! You make a giant batch ahead of time, freeze in foil containers and then pull individual servings out of the freezer and put them in the oven on those nights you're just too tired to cook but craving a heart-warming homemade meal. Thank your future self now for meal prepping in the best way possible! 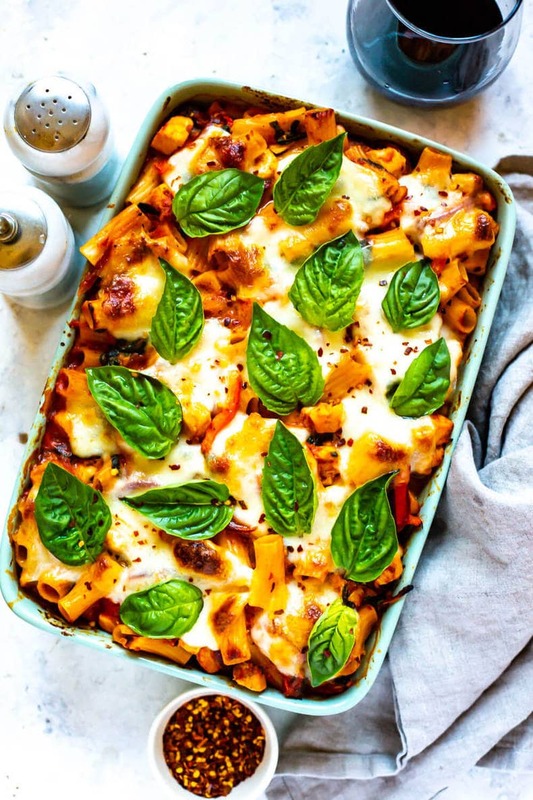 While I absolutely LOVE this Chicken Pasta Bake it really is just a simpler version of this Penne alla Vodka pasta bake. OMG guys, the sauce on that other pasta bake is to DIE for and really worth the little bit of extra effort. 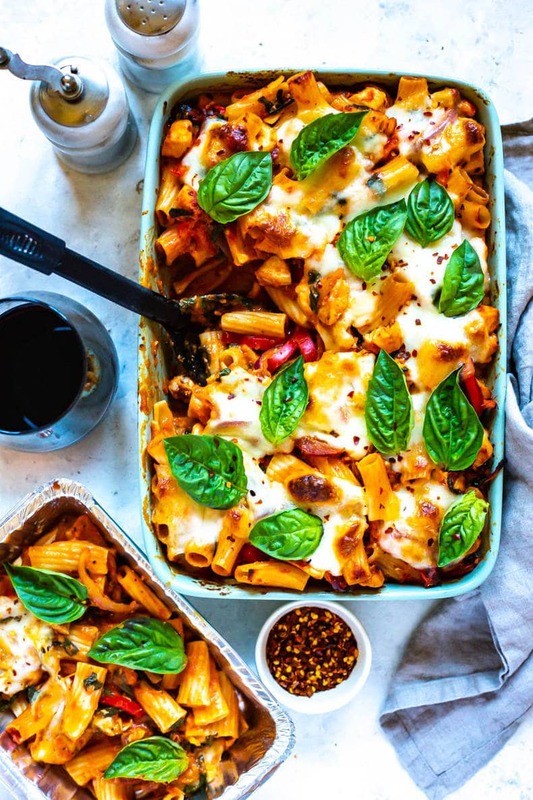 But, if you're like me and cooking constantly and just need to get your regular meal prep in, then this chicken pasta bake is up your alley. You're using mostly basic ingredients that you already have on hand at home so you don't have to go running all over the place to the store, and you can even switch up the veggies you use. A regular old jar of pasta sauce works so you're eating good in no time! This chicken pasta bake is filled with a very simple “rose” sauce, no heavy cream needed. The secret is basically jarred marinara sauce and half a cup of sour cream – it's a lighter version of rose sauce and you likely already have sour cream on hand in the fridge. Of course you can also feel free to omit it just to make things simple as well. I like to use a thick pasta like rigatoni because I find it really soaks up a lot of sauce without causing the pasta to fall apart. From there, you're just going to throw in a couple diced up chicken breasts and your veggies – I used sliced red onions, bell peppers and spinach because I usually have all three on hand in the fridge at any given point in time, but you can definitely feel free to switch it up and use mushrooms, broccoli, carrots…anything you can think of really! Making this chicken pasta bake is SO simple! There may seem to be a lot of steps if you watched the video, but honestly you really only end up dirtying two pots and you can always wash the dishes/enjoy a glass or two of wine while your pasta is baking in the oven. You'll want to cook the pasta to just before al dente – you still want it to be a bit firm so it has time to soak up the sauce without falling apart. 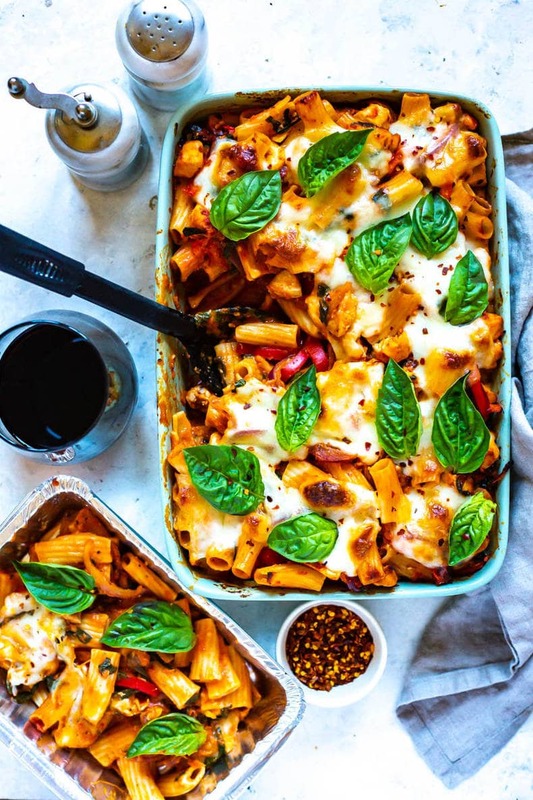 Rigatoni and penne are good pastas to use in this pasta bake, and so are bowties. Once you've drained your pasta, saute your chicken for a couple of minutes and then add in the red onions, garlic and seasonings. Pour in the sauce and sour cream, stir to combine then stir in the spinach, red peppers and pasta. Load it all up into a greased 9×13 oven-safe dish and top with cheese, then bake for 25 minutes. Boom, done. 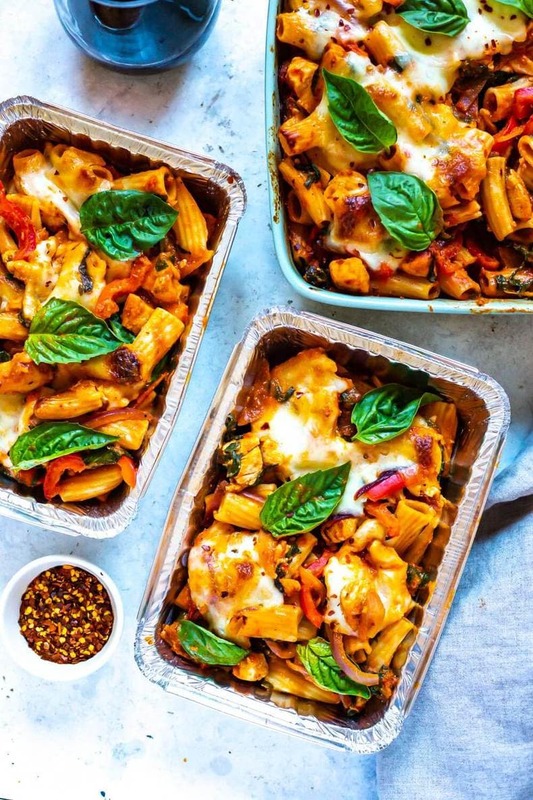 What really makes this chicken pasta bake amazing for meal prep though is the fact that it's a freezer meal! I like to buy these foil containers from the dollar store to freeze individual portion sizes in because that way you can heat them up right in the oven – you'll want to reheat in a 350 F oven for 20 minutes or so until everything is warm and the cheese is melted. 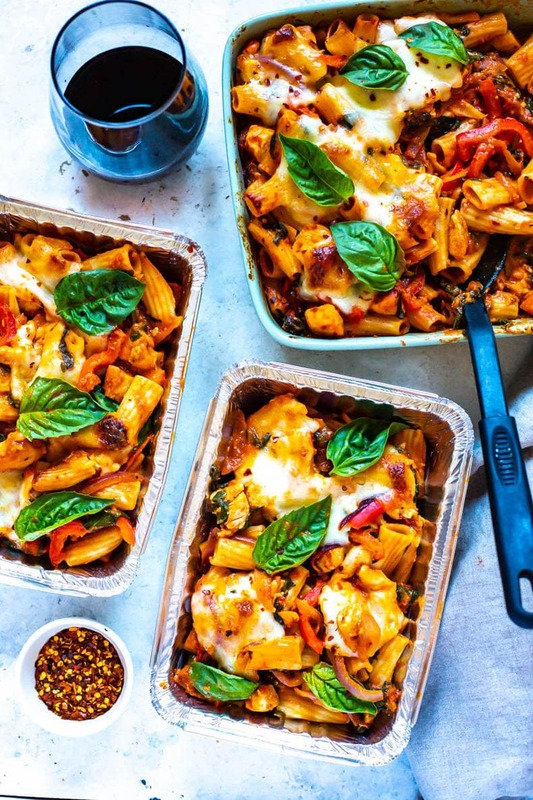 Otherwise, you can freeze this chicken pasta bake in glass meal prep bowls and just reheat in the microwave – I do recommend using the oven though because it'll give you that fresh pasta taste and texture. The microwave sometimes dries pasta out. 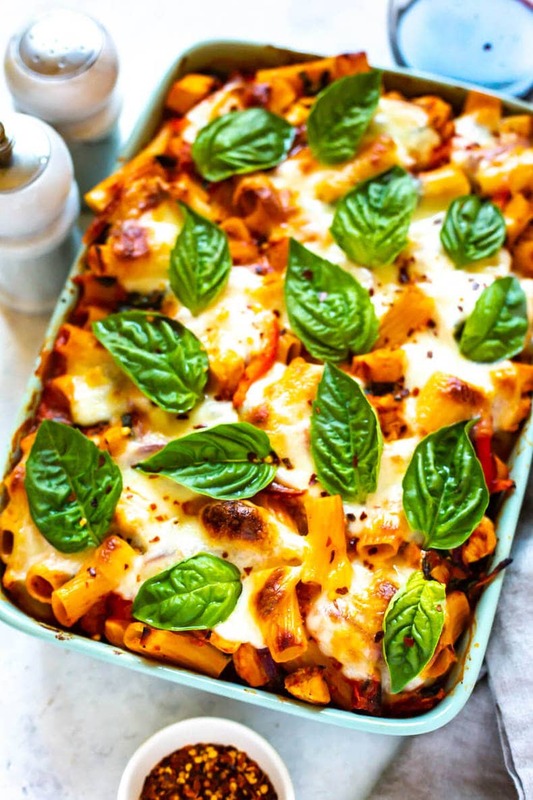 Garnish your pasta bake with some fresh basil or parsley right when it comes out of the oven and you're set to go! 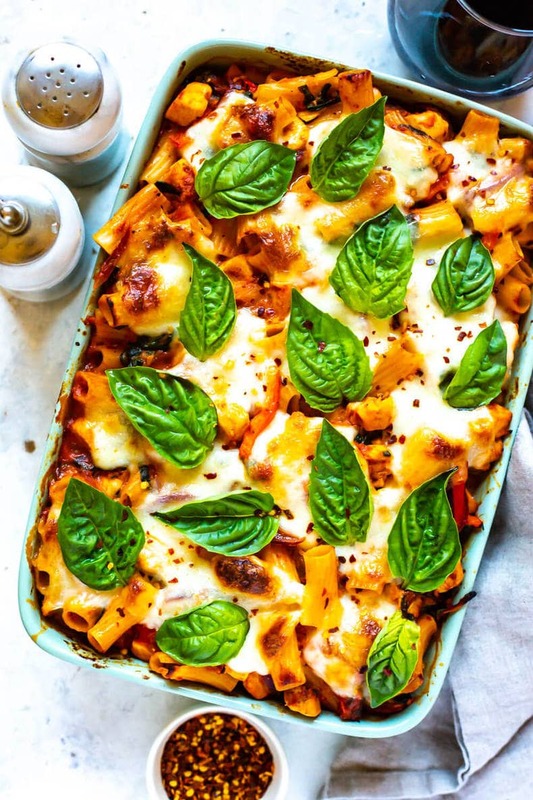 I do highly recommend adding the fresh basil because it brings some colour to the finished dish and some freshness – and any kind of extra greens really never hurts! Will you be making this Chicken Pasta Bake? And if you're looking for more delicious freezer-friendly recipes I have this round up of make ahead freezer meals to get you through the winter season! 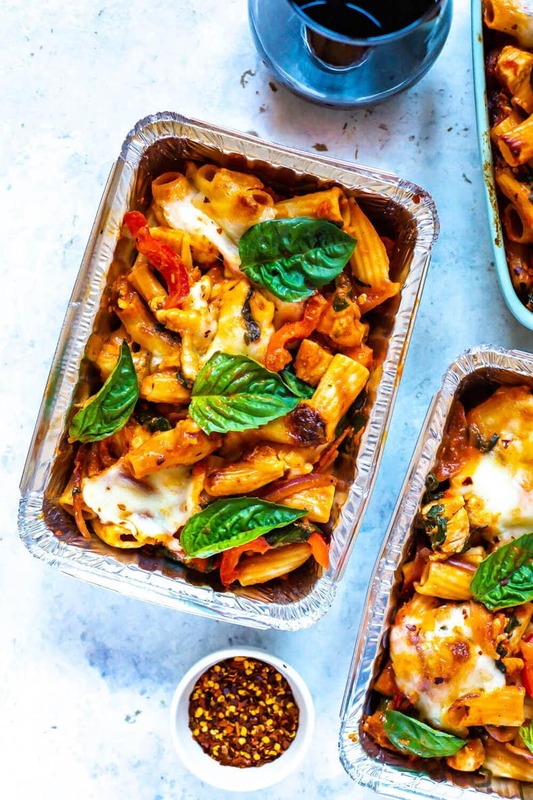 Grab some glass meal prep bowls if you plan on packing this Chicken Pasta Bake in the freezer and defrosting in the microwave. Preheat oven to 375 F. Cook pasta to just before al dente, about 6-8 minutes. Drain and set aside. Meanwhile, heat olive oil in a large saucepan over med-high heat. Add chicken and cook for 3-4 minutes until lightly browned. Add onions and garlic, sauteeing another 1-2 minutes or so until fragrant. Add in marinara sauce, sour cream, salt and pepper and chili flakes, then bring just to a boil, stirring well. Stir in red pepper and spinach, and then toss pasta in sauce mixture and remove from heat. Add pasta to a large greased 9x13 dish and then top with mozzarella cheese. Bake in the oven for 25-30 minutes until cheese is melted and starts to brown. Remove from oven, garnish with basil leaves then serve and enjoy! You can freeze individual portions up to 3 months. To reheat, defrost in the microwave for 6-7 minutes or reheat in a 350 F oven for 20-30 minutes. This looks delicious! Just curious -where did you get your 9×13 casserole dish? Hey Emma! You can order a 9×13 dish online through Amazon through this affiliate link (https://www.amazon.com/gp/product/B01IUKIPYY/ref=as_li_qf_asin_il_tl?ie=UTF8&tag=thegirlonbloo-20&creative=9325&linkCode=as2&creativeASIN=B01IUKIPYY&linkId=dba5afa019ff5144c2f40e0ed69cf387) or pick one up at any store that sells kitchenware. I believe I got mine at Canadian Tire but you should be able to find one at any department store or kitchen store. Hope that helps! Ok so do you fully cook in oven and THEN freeze? I can freeze this in the 9 by 13 glass dish, right? Any advice. Defrost overnight first in fridge? Hey Julie – you can if it has a lid but I would avoid this if possible. It would take up way too much room in your freezer and then you would be without your casserole dish. I would recommend dividing the pasta into individual-sized servings in smaller glass containers with lids and freezing from there. To reheat, you can microwave on high for 6-7 minutes from frozen with a little water sprinkled overtop. No need to defrost in the fridge first. Thanks. But, I want to make it in advance and serve entire casserole to family coming later in month.I have room in my freezer, etc. SO, with that in mind, night you suggest overnight in fridge before cooking? Saran and foil would work , yes? Other advice? I would assume this would work! I have not tried this method myself though unfortunately. I have just reheated straight from freezer to microwave or oven.